Fit both the 2009-2014 and 2015-up Ford F-150 for an aggressive Raptor style! 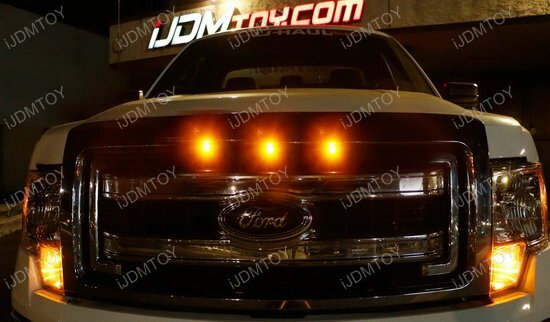 Q: Will this Raptor Style LED Grille Lighting Kit fit my truck? 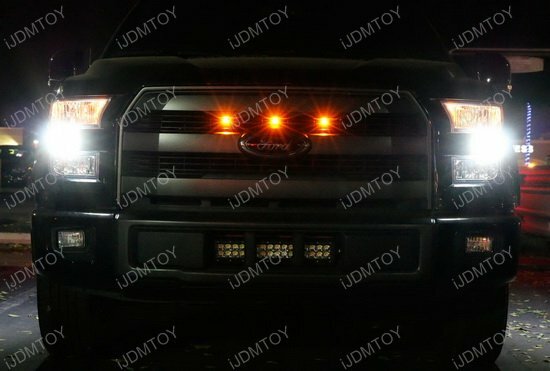 Q: Is there any modification required to install the Raptor Style LED Grille Lamp? A: Nope, there is no modification required for installation. 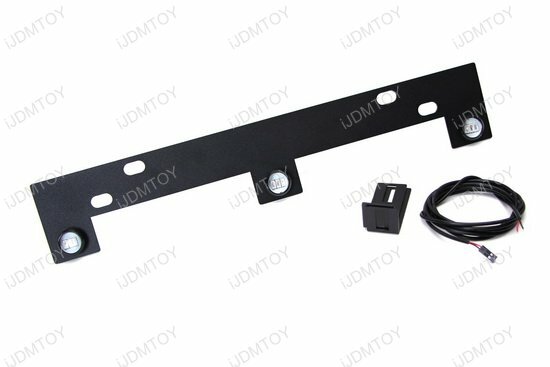 You will be directly mounting the Raptor Style LED Lighting Kit behind the front grille using the included L-shaped brackets for the 2015-up model or directly mounting the assembly using the existing nuts for the 2009-2014 model. 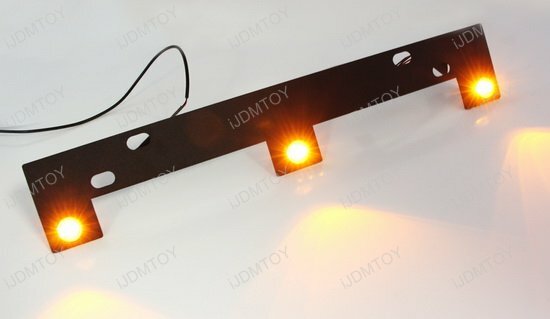 Q: Where do I mount these Raptor Style LED Lighting Kit? A: You will be mounting these Raptor Style LED lighting Kit at the upper part of the grille; you will get more illumination and have a more aggressive look. Q: Am I able to change the colors of the LEDs? 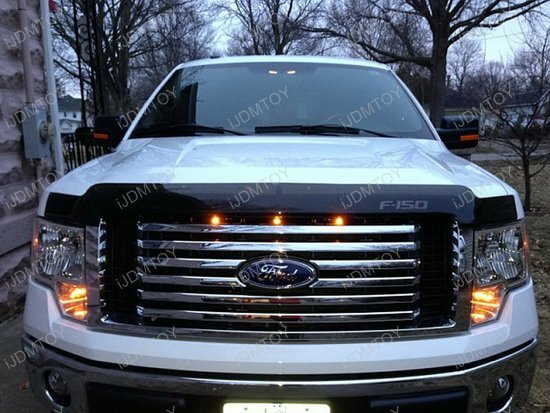 A: Yes, you can change the colors of your LED diodes in your Raptor style grille lighting kit. 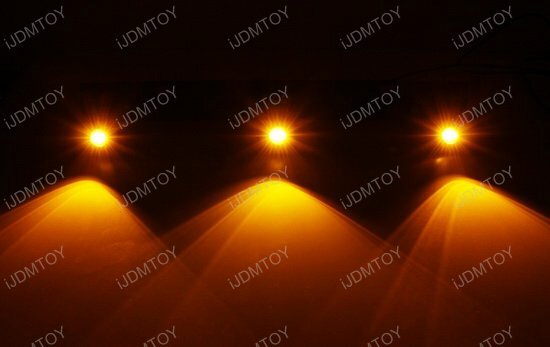 We have designed them so that you can easily replace the LED emitters in case they burn out or you want to change out the LED lights for a different color. Q: How do I remove the LEDs to replace them? A: Remove the nut securing the LED diode. Use another tool such as a plier to hold on to the threads in order to loosen the nut. Otherwise, the LED diode will just turn along with the nut. Take off the tape holding down the wires and detach the wires from the other LED emitters. 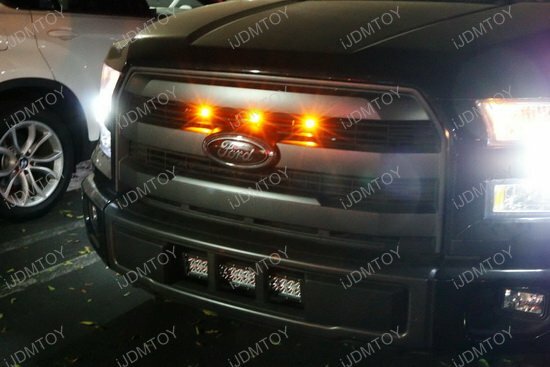 This page features a set of Raptor Style LED Grille Lights Kit for the 2009-2014 and 2015-up Ford F-150. The Raptor Style LED Grille Light Kit comes with an exclusively designed steel mounting bracket to allow you to install these super bright LED lights right behind the grille. 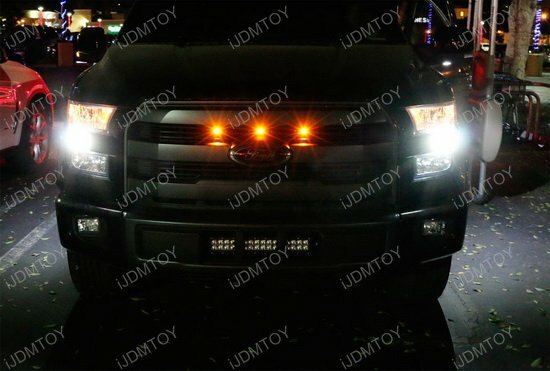 This LED kit is powered by 3 pieces of 3D projector LED lamps, which are much brighter than the stock Raptor grille lights. 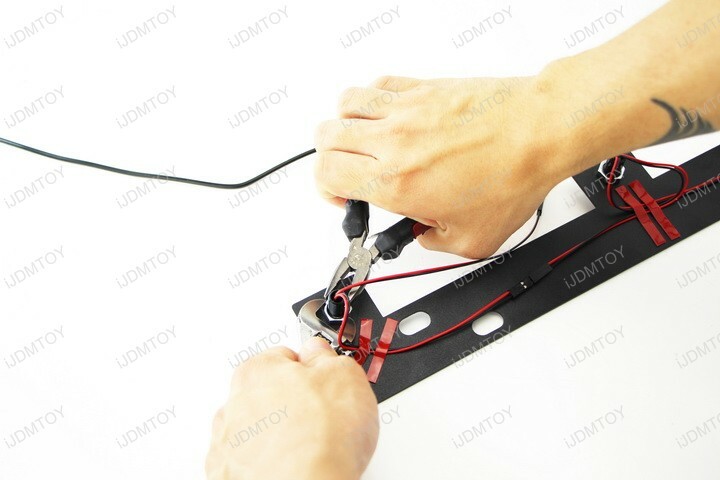 The LED grille lamp kit is is pre-wired with the wiring cord included. 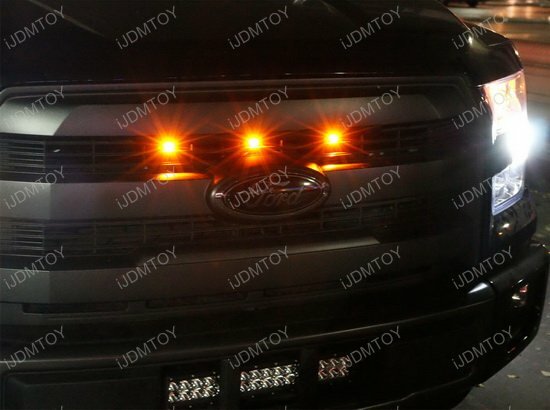 If you wanted to give your Ford F-150 a super aggressive look like the Raptor without having to buy its namesake, then these grille lights will definitely transform the front end of your truck to look more high end. Instructions for 2015 and up Ford F-150 installation are lacking in some areas and dont apply to all grille styles, but I was able to figure it out and am overall very satisfied! 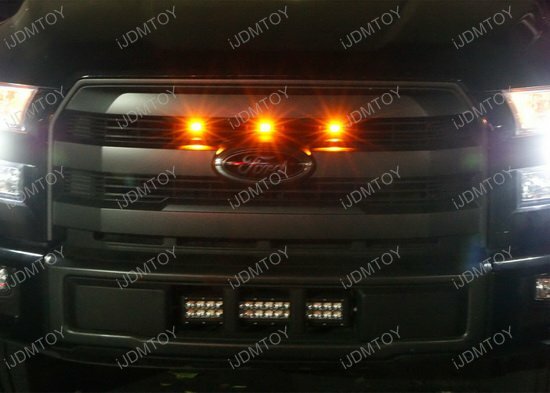 The Raptor style LED grille lights definitely look good! The Raptor style LED grille lights fit great on my 2015 Ford Lariat f150. Work great. Really like them. Nice Raptor style LED grille lights, installed on our Custome 2017 STX. Made a few minor improvements to the wiring and connectors but over all very happy for what it costs for a true LED light kit. Just installed on my 2016 f150 XLT sport fit just fine right in the top grill slots they have two mounting positions and are adjustable I installed the bracket upside down to fit my application and I installed wire loom cover to protect the wires I recommend that the installer be mechanically inclined.